Juns Jewelry Box is made of the finest PU leather, attractive appearance, multifunctional structure and fine workmanship. Works well to keep your watches, rings, sunglasses, cufflinks, necklaces, bracelets, earrings, ear studs, hairpins, jewelry and other matching items. It's also a wonderful gift idea! Premium quality PU Leather smooth exterior with a mirror inside. The interior is covered in soft elegant velvet to protect your beloved jewelry from scratch and damage. With elegant appearance and considerate design, this jewelry box is great for personal use, shop display and home decoration. 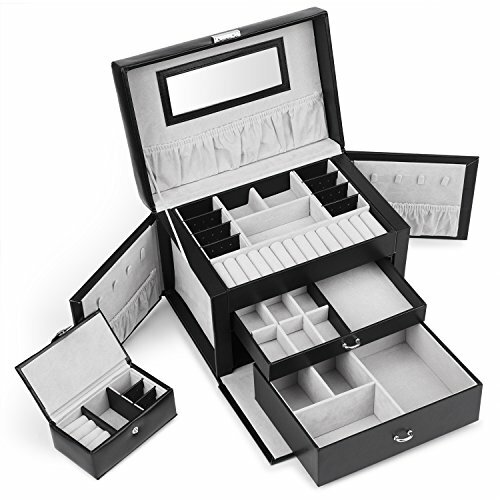 1.DIVERSIFIED COMPARTMENTS: JUNS Jewelry Box has 20 compartments try to hold your watches, rings, sunglasses, cufflinks, necklaces, bracelets, earrings, ear studs, hairpins, jewelry and other accessories. 2.GREAT GIFT IDEA: Packaged in an elegant gift box and easy-to-open design and enough to be an elaborate gifts on Birthday, Mother's Day or Valentine's Day ; makes it perfect gift for your loved one i.e. Mother, girlfriend, wife, daughter or colleague. 3.UNIQUE DESIGN: The jewelry box made of premium quality artificial leather and soft elegant velvet on the inside. A delicate sliver latch with 1 key adds security to the jewelry organizer, high quality MDF frame. 5.100% SATISFACTION GUARANTEE: We are always available to provide a professional customer service before and after your purchase. If for any reason you're not completely satisfied. Simply let us know and we will either replace it or refund your money. The best choice for you! If you have any questions about this product by Juns, contact us by completing and submitting the form below. If you are looking for a specif part number, please include it with your message.